In what is hopefully the first of many to come, The Oregon Wine Blog presents its very first book review. I'd also like to note that, unfortunately, this review has been delayed entirely too long. While some would say we're lazy, I like to think that we simply let it age and mature. How'd it stand the test of time (3 months)? Let's find out! 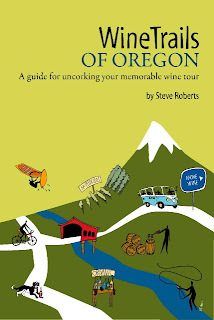 To preface our review, Wine Trails of Oregon's author, Steve Roberts, contacted us personally and sent us an autographed copy of his latest book. After writing Wine Trails of Washington, it only made sense to write one about Oregon. Perhaps even more unique is his Idaho rendition coming out in Spring 2010. Anyway, onto the review now that that's out of the way. Steve Roberts, in an effort that can only be described as monumental, set out with one goal; to visit every single winery in the state of Oregon and write about it. Daunting? Perhaps. Worth it? Totally! Wine Trails of Oregon is essentially a comprehensive almanac of every winery in the state of Oregon. Each winery's information is displayed in a standard two-page format listing it's name, the story behind it, what's good, contact information, general demographic information, directions, and even a map of its general location in relation to what county it's in. For example, let's say you're visiting some friends in Corvallis and want to see what wineries are around to go tasting. OWB staff happen to be out of town tasting elsewhere, so you must consult your trusty guide. Wine Trails of Oregon is so well organized that the table of contents would quickly guide you to "South Willamette Valley." This section would then break down 8 wineries in Benton County alone. Want to go a little further south? There are 11 more in Lane county as well. The possibilities are endless (or 19 if you're counting). So what's the verdict? If you live in Oregon and like to go wine tasting, this is an absolute must buy. If you're out of state and want to learn more about the 200+ wineries listed in this book, I'd also recommend picking it up. This book is out now and is available for $24.95 from Powell's Books (our personal favorite book store). BONUS THOUGHT: While this is an incredible book, the inner-nerd in me had another thought. One device almost all of us at the OWB have on hand is an iPhone and since this book uses a consistent template, this would make an AMAZING iPhone app. While I don't know the feasibility of that project, I can't imagine having a more convenient way of planning a wine tour than having all of that information in a gps-enabled application. Just a thought. Oh, and we're planning some features on Washington in the upcoming months and I think we might pick up a copy of Wine Trails of Washington to assist. The feasibility of an iPhone application should be pretty good. California has one out now among other states. You should create it :) I am excited to pick up this book. Although the internet is a valuable tool for looking up tasting rooms and wineries, having the background information and recommendations all in one place will be nice. Have you ever read Susan Sokol Blosser's book At Home in the Vineyard or Brian Doyle's The Grail? Those were my last two wine reads. Right now I am in the middle of Natalie MacLean's Red, White and Drunk All Over (great title). Also, Linda Kaplan's "My First Crush" is a great wine read. We're frequent visitors to Oregon wine country but still found the book useful and informative. It's a most refreshing change from other guides because it's more about the atmosphere of the winery and the personalities of the winemakers than wine. In wine tasting, it is about the experience as well as the wine. The chart in the backs gives great details about the type of wines each vineyard produces and the maps are great. I'd recommend it. Thanks everyone for the great comments and suggestions. It looks like the OWB should do more book reviews. Any other wine-related suggestions that are must-reads?